After I kept on hearing about Burger and Lobster, the good reviews, but more worryingly, the insane queues and long waiting times again and again over the summer, Alessandro, two friends and myself went to their Soho restaurant one Wednesday after work (foolishly thinking it would be easier to get a table on a midweek day during the summer months). Despite it being a Wednesday, the place was heaving and we were told we would have to wait 45-60mins for a table. Fortunately at the back of our minds we had expected this, none of us was starving yet and we were able to kill time over some cocktails and duck rillettes at Cafe Boheme while people-watching (one of my favourite activities in London). After about 40 minutes, we got a call from the restaurant that our table was ready and we made the short walk back to Dean Street from Cafe Boheme. Burger and Lobster. Although the name of the restaurant might imply some surf ‘n’ turf action where you get to eat BOTH a burger and a lobster, you in fact have to choose between the two (and decide whether instead of a burger or a whole lobster you would rather have a lobster roll). All three are served with a small side salad and some chips. Despite our long wait for a table, once seated things started to move rather quickly. As the menu is pretty short (three dishes plus, in the case of lobster, the option of whether you want your crustacean steamed or steamed AND barbecued and what type of melted butter (clarified, clarified with garlic) you want to go with your crustacean), we ordered within a few minutes of sitting down (two steamed and barbecued lobsters, a lobster roll and a burger, all washed down with beer and soft drinks). Shortly thereafter we were given those hideous (but hilarious at the same time) plastic aprons to put on (fun fact, in Italy they serve these as well for certain pasta dishes that are prone to cover you in tomato sauce). The fact that most of the restaurant was wearing these made the whole experience actually quite comical – I mean how often do you get to see a room full of adults wearing bibs and eating with their hands? So how was the food? 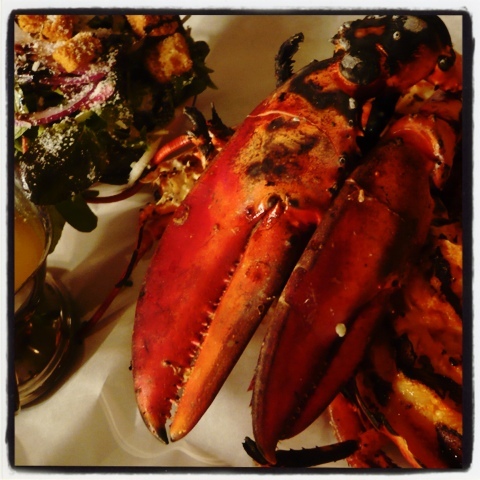 Good is the first word that comes to mind, but that is easy – who does not enjoy some salty chips and lobster doused in melted butter when you start dinner after a 1h wait for your table (and after you have already downed a significant amount of alcohol …). The barbecued lobsters were possibly slightly dry and next time I would order the steamed lobster. But both the chips and the side salads were actually really nice (sadly far from a given in most restaurants) and the burger was good too (although, as almost invariably the case these days, the bun left a lot to be desired). Funnily enough our only real issue with the food were the portion sizes – it is rare that Alessandro complains about restaurant portions whichever side of the pond being too large yet here even he struggled to finish his burger and fries and although you cannot complain about paying £20 for in London for fresh lobster it is still not cheap as a dinner option. However, our struggle to finish our food could well have had something to do with the duck rillettes we had pre-dinner… In any event, the food was good, the portion size very very decent for the price (and the price very very decent for eating lobster in London) and overall it was a good night and I would happily go again if the opportunity came up. For now Burger and Lobster only has two locations in London, one in Mayfair and one in Soho. Although, on a recent walk home I spotted a sign on St John Street that they are opening a third restaurant in Farringdon sometime later this year. Looks nice. The Canadian (not British) Lobster was my only issue. (Lobster Burger emailed me this info after I quizzed them, some time back). Nice blog will read and comment more. Point well made (and something I did not even realise! ).